With an aim to raise public awareness about traffic rules and ultimately to reduce casualties due to road accidents. 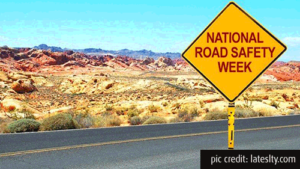 The Ministry of Road Transport & Highways, Government of India announced the observance of the 30th Road Safety Week Campaign from February 4-10, 2019. The theme for this year campaign is ‘Sadak Suraksha – Jeevan Raksha’. The week-long initiative will have road safety driver training, health & eye check-up camps for drivers at 20 Truckers Hub in India. Road Safety workshop is being organised by the Ministry in every city participating in the event along with the other programmes. A seminar on ‘Emerging Trends of Road Safety’ supported by the secretary of MoRTH and special commissioner of police was organized to provide training, technical and brainstorming sessions to the people. A variety of educational banners, safety posters, safety films, pocket guides and leaflets related to the road safety will be distributed to the on-road travellers. Delhi Police is organising a week-long awareness campaign to make people aware about traffic rules and dangers of drunken driving and over speeding. Reflective tapes were distributed to cyclists and were urged to use the cycle tracks wherever available. NGO’s volunteers and school children also took efforts to make people understand the importance of wearing helmets and seat belts. Madurai Traffic Police organised awareness campaigns and walkathons to make people aware of traffic rules and signals. Health camps are being organised in Jammu for the drivers and emphasis was made on abiding traffic rules and wearing helmets and seat belts. Painting competition was organised in Puducherry in schools and colleges with the theme ‘Road Safety, Life Safety’. TATA Steel, Jamshedpur organized various programs on road safety and is conducting dramas and skits showcasing the importance of road safety. Amritsar Traffic Police organised a Rangoli competition to observe the Road Safety Week and held talks on road safety. Road safety leaflets including roses, chocolates and flowers are distributed to the travelers on the road. Various road safety announcements, exhibitions, road rules test, girls scooter rally to encourage the use of helmets, debates on road safety at the All India Radio, workshops, seminar and etc activities are organized. Free medical check up camps and driving training workshops are being organized for the drivers to encourage them towards the road safety.